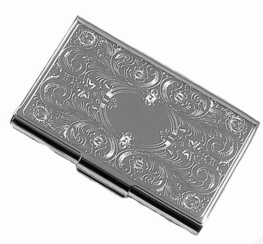 This slim silver finish business card holder has a beautiful floral design on the front with an oval space for engraving. You can engrave a name, initials or short message on both the front and back of this business card case. The slim design of this business cardholder will make sure it fits into any pocket or purse.